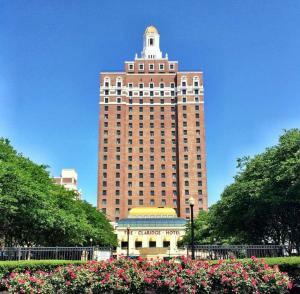 When you stay at FantaSea Resorts Atlantic Palace in Atlantic City, you'll be on the beach, just steps from Ripley's Believe It or Not Odditorium and Central Pier Arcade and Speedway. This beach resort is 0.4 mi (0.7 km) from Atlantic City Public Library and 0.6 mi (1 km) from Monopoly Monument. Make yourself at home in one of the 199 air-conditioned rooms featuring kitchenettes with refrigerators and stovetops. 42-inch flat-screen televisions with cable programming provide entertainment, while complimentary wireless Internet access keeps you connected. Conveniences include phones, as well as safes and desks. Be sure to enjoy recreational amenities including an outdoor pool and a fitness center. Additional amenities at this resort include complimentary wireless Internet access and an arcade/game room. At FantaSea Resorts Atlantic Palace, enjoy a satisfying meal at the restaurant. Quench your thirst with your favorite drink at the bar/lounge. Breakfast is available on weekdays from 8 AM to noon and on weekends from 8 AM to 11:30 AM for a fee. Featured amenities include complimentary newspapers in the lobby, luggage storage, and laundry facilities. Self parking (subject to charges) is available onsite. When would you like to stay at FantaSea Resorts Atlantic Palace ? Each day we'll check prices and send you an email for your selected dates at FantaSea Resorts Atlantic Palace. If you don't have specific dates but would like to check prices for say next weekend or say next month we can check the price too. Click to write a review and share your experience of FantaSea Resorts Atlantic Palace with other travellers.